ITS WEDDING SEASON!!! 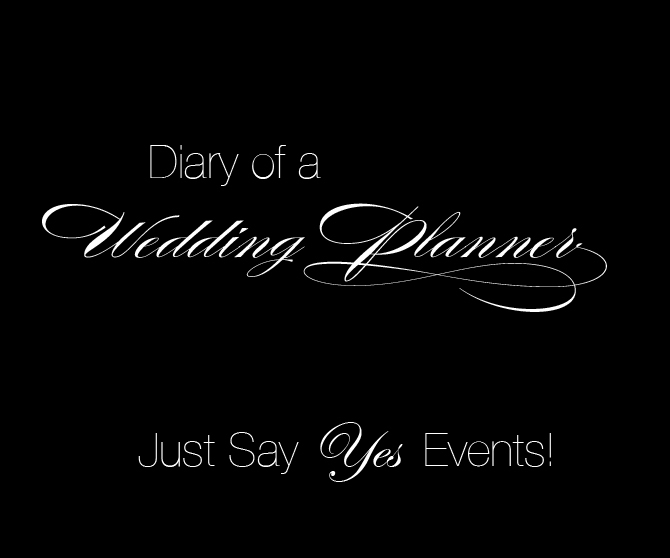 and "Just Say Yes" is having a great time participating in tons of bridal shows. We love meeting new clients and vendors as-well. Our last bridal show was held in the super posh Metropolitan Club, Willis Tower. Couples had a chance to view premier Chicago vendor showcases, taste wonderful hors devours, cocktails and view a two full ceremony set ups. It was an amazing event and we are very excited to have participated. The designers at Just Say Yes wanted to create a romantic and luxurious showcase with gold touches, soft linens and tons of crystals. Our showcased turned our exceptional and we are proud that we inspire couples to try something different. Heres a quick walk you through what we created. Custom crystal tree created with manzanita trees, crystals, hydrangea, roses & hanging votives. It is an absolute show stopper dripping in crystals and gives of a feel of grandeur. Place setting: The place setting were very lavish yet soft. 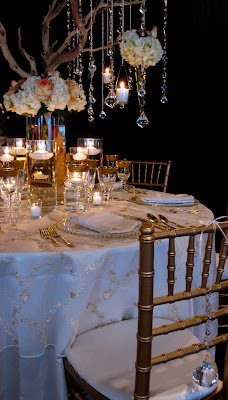 We used a glass charger with gold bead detail, gold flatware and stemware. The napkin was folded in a very simple fold with tulle fabric detail for texture as-well as a soft feel.